1. Heat a flat pan over moderate flame. 2. Add the chicken breasts with 4 tblsp lime juice and oil. 3. Stir for a minute and remove. 5. Cook the chicken breasts on a preheated grill for 6 minutes each sides or cooked through. 6. Combine the tomato, avocado, coriander leaves, remaining lime juice, salt and pepper. 7. Mix well and spoon it over the chicken. 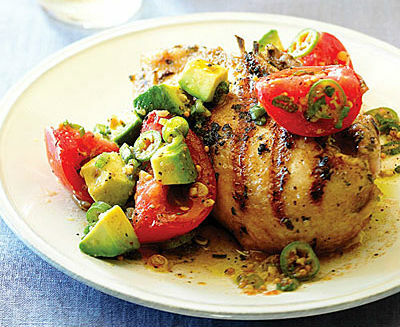 Feel free to comment or share your thoughts on this Grilled Chicken with Tomato Avocado Salsa Recipe from Awesome Cuisine.